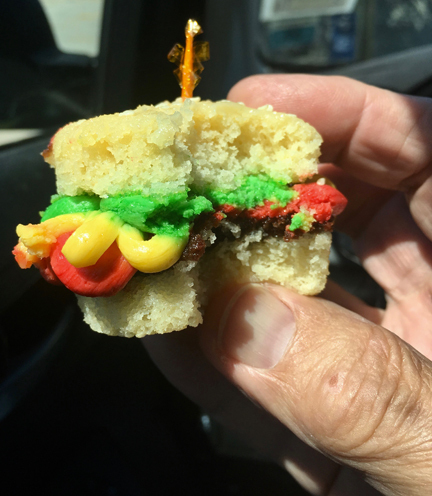 Summer is burgers-on-the-grill season... but, apparently, also faux-burgers-in-cupcake-form season. This once-bitten example was not shy about being a production of Mary Ann Williams, for the Brooktondale Market, near Ithaca, NY. It’s summer, so we spend a lot of time on the road. This gives us the opportunity to try many regional beers and local variations on the hamburger theme. So far, the most interesting one was layered with bacon, sliced jalapeños, and pimento cheese. Some day we’ll post photos of the beer cans and bottles we’ve sampled, as we seem to be living in the golden age of “artisanal” beers and—even more—artisanal labels. We’ve been distracted from writing about food lately (a non-foodish novel has been taking up our time, instead). So, no new links of our own; just the usual monthly potluck, below. This month’s quotes (from On the Table’s culinary quote collection are about some of the surrogates we are invited to ingest. They are amusing in much the same the way that gallows humor amuses us. PS: If you encounter broken links, changed URLs—or know of wonderful sites we’ve missed—please drop us a line. It helps to keep this resource as useful as possible for all of us. To those who have pointed out juicy sites (like Nicola Miller), thanks, and keep them coming! Lots of “Craft” Beer Is Brewed by Anheuser-Busch. Here’s How to Spot the Real Stuff. Social Media and the Great Recipe Explosion: Does More Mean Better? The Resource Guide for Food Writers, Update #202 is protected by copyright, and is provided at no cost, for your personal use only. It may not be copied or retransmitted unless this notice remains affixed. Any other form of republication—unless with the author‘s prior written permission—is strictly prohibited.